Food Costs > How Much Do Potatoes Cost? How Much Do Potatoes Cost? Potatoes are one of the most consumed vegetables in the United States. As a matter of fact, most Americans eat nearly 50 pounds of potatoes every year, according to the United States Department of Agriculture. Depending on the type of potato, the costs will vary anywhere from $1 to $2 per pound on average. Larger quantities can cost as little as $2 to $5 per 10-pound bag. The biggest cost factor is the type of potato, the time of year and where it’s purchased. Refer to our table below to see what popular varieties will cost. For instance, a 5-pound bag of russet potatoes could retail for $3 to $5. A 5-pound bag of white potatoes can cost $2 to $4 each. Fingerlings average $1.50 to $2.50 per pound. A gold potato will cost $1 to $2.50 per pound. Purple potatoes can average $1 to $2 per pound and red potatoes can cost $1.25 to $2.50 per pound. At Costco.com, a 20-pound bag of baking potatoes cost $4.99, while a 50-pound bag of baking potatoes (US #2) costs $7.72. A 10-pound bag of small red potatoes (US #1) cost $5.54, while 50 pounds of red potatoes (US #2) cost $7.72. When working with fresh potatoes, there are many tools you can use to make cooking easier. There are many forms of potato cutters that could turn the potatoes into chips, fries, or wedges. There are also potato peelers available to remove the skin from the potato. Fresh potatoes usually come in the following consumer unit packages: 5-, 10-, 15- or 20-pound bags. Depending on the variety, three medium russet potatoes or about 10 small white potatoes equal one pound. Bags for potatoes packed for public consumption typically carry information about the contents, including the potato variety, its origin, the grade, and weight. Bags will also contain nutrition information. The U.S. No. 1 is the grade most often seen in consumer bags sold at a local grocery store. The U.S. grade standards are changed from time to time to keep pace with changes in production, marketing procedures, and consumer preferences. When buying fresh potatoes, choose one that is firm and has smooth skin. 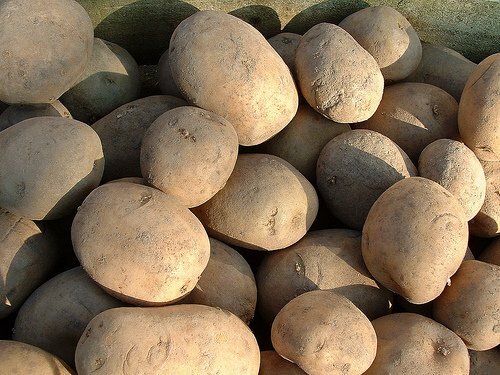 Avoid buying potatoes that have been washed because they spoil more quickly than unwashed but moderately clean ones. Do not purchase potatoes with a greenish shade or cast. They produce a bitter taste and may be toxic. Washing potatoes before they are stored can cause dampness that can increase the odds of decay. Store potatoes in a cool place to maintain its quality longer. Instead of buying loose potatoes, go with bagged spuds instead. Loose ones can cost $1 a pound, while a 5-pound bag can be as low as $2.50. Local produce warehouses also sell potatoes at much lower prices. A 50-pound box of #2-grade potatoes can be bought for as little $5. Visit dollar stores. Some of them sell bags of potatoes for 99 cents. These will be smaller bags, but it is still cheaper than a chain grocery store.